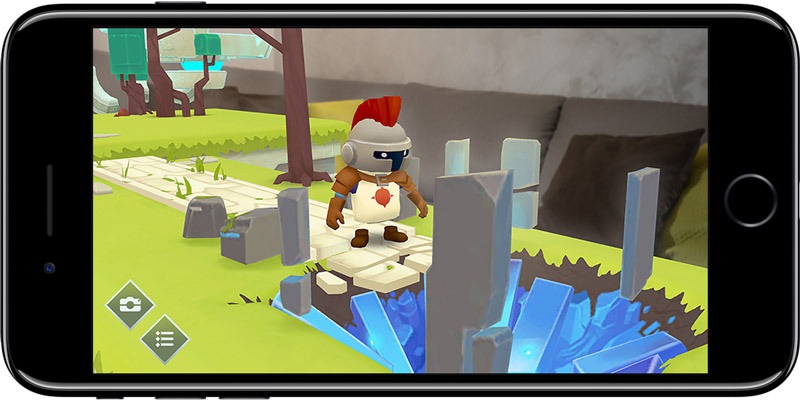 ARise is an episodic puzzle platformer game for Apple AR, offering ground breaking AR puzzles where you can discover and complete optical illusions, scale mountains and awake golems. ARise is an example of what unique gameplay is achievable using Apple AR technology (ARKit). 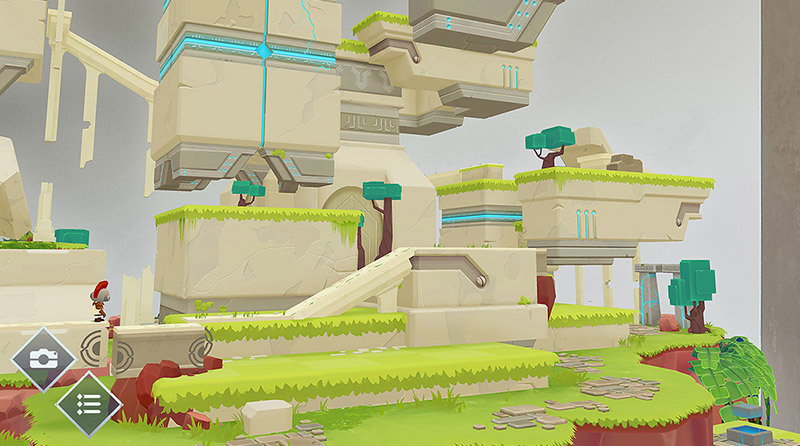 ARise is a puzzle platformer in which you need to solve puzzles by physically moving around the environment. The great thing about this game is its unique gameplay mechanics. You don't need to use any hand gestures in this game, the interaction is made solely by moving around the floating islands and looking for visual cues. Those the areas where you need to aim and align magical connections to create paths for the Roman soldier character to move through. The main quest is to reach the top, retrieve the sacred sword and awaken the monster. Once the island is placed into the real world you can rotate around and view it from any angle. This is, of course, possible due to the unique AR technology itself. You can look around, below and over the island in any direction. The gameplay mechanics are simple yet very innovative. Instead of using finger gestures that just obscure the visuals, it relies only on your body movement. In the island, there is a character that looks like a Roman soldier. The solder needs to get to a designated end point, but he can't-do it without your help. As you move around the island, you'll notice visual cues which signifies a location where a puzzle needs to be solved, without solving it, the soldier won't be able to move and he will just get stuck. Some of the puzzles involve in aligning connections by solving the optical illusion, means that you need to look at the connector from a specific angle to reform an imaginary path for your soldier to move along. The connection dots will light up and glow once you aligned them right. ARise is a beautiful game, it really is. I really like the charming and relaxing visuals and it's amazing to see how this huge island just sits there in your living room waiting to be explored. Your character will move around the island but in a way that will force you to move around and search for it, which is a really cool mechanic. 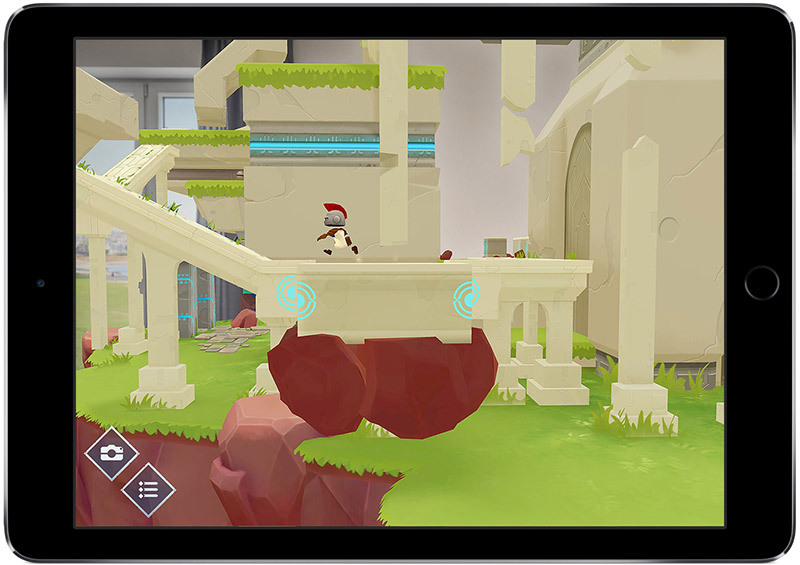 I also like the use of elevation which encourages you to stretch your body up and reposition your iPhone or iPad so you can solve the next puzzle at that higher location or alternatively, crouch down to follow the character from a lower point. The puzzles are not complicated but can be tricky at times, because you need to accurately align the dots both vertically and horizontally and for that you find yourself needing to move slightly forward and backward to nail it right. I've checked out some gameplay videos of users who played this game in different locations. It's really amazing to see this game played outdoors in the garden or in the parking lot. It's like every place turns into a playground and it's amazing to see it happen. 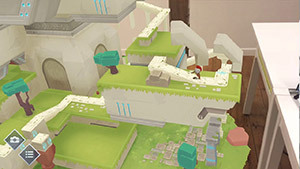 ARise reminds me of another non-AR title called FEZ, which is a 3D puzzler that gives the player the ability to navigate 3D structures from four distinct classic 3D perspectives. The perception mechanics is what made this game stand out. ARise is still not there when it comes to the number of stages, secret areas, and in-depth gameplay mechanics, but it's a starting point for great things to come. I do hope that the developer will introduce more advanced levels with secret areas and different types of puzzle-solving experiences than what World 1 had to offer. ARise is a wonderful little AR puzzler. The premise of the game is very interesting and innovative. Building a puzzle game around perspective isn't new, but it feels completely different when you play it in augmented reality. I highly recommend checking this game out.